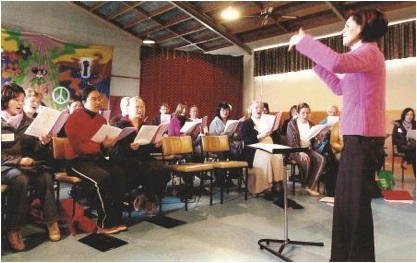 For many years the number of people learning the craft of conducting in New Zealand was small. The people involved tended to be specialists rather than conductors of the hundreds of school, church or community choirs. Certainly, workshops, university classes, and private lessons were offered from time to time – mainly in the cities – and visiting conductors were sometimes invited to present conducting sessions, eg, Frank Pooler, Eric Ericson, and David Jorlett. However, influenced by the English choral tradition, conducting was generally thought to be something that could be picked up by being in an excellent choir, observing a good practitioner and working out one’s ‘own salvation’ while in front of a choral group. Even for the many leaders of primary and secondary school choirs there was very little systematic training available from teachers’ college music departments, district music advisers or continuing education agencies; they just didn’t see building a vocabulary of conducting skills as one of their priorities. It was inevitable that some conductors would look overseas for opportunities for professional development in their field. At about the time that Guy Jansen went to the University of Southern California for graduate study, Peter Godfrey investigated the teaching of conducting in various institutions overseas, including visits to Westminster Choir College in Princeton, and USC in downtown Los Angeles. Peter then began a course within the University of Auckland, and choral musicians began to study there to benefit from his great choral experience. The other influential teacher at the time was Professor Jack Speirs at the University of Otago. Students of Jack Speirs and his successor Peter Adams, who have gone on to professional conducting careers, include Tecwyn Evans, Michael Joel, and Holly Mathieson. Graduating from the Auckland course, Karen Grylls was encouraged to continue her studies abroad, and upon returning began to influence the standard of conducting quite dramatically around the country. She was sought-after for workshops and guest conducting, and when she gained a full-time position at the University of Auckland was able to develop the existing conducting course into a major segment for music students’ programmes. Her key role as the new director of the New Zealand Youth Choir gave her a high profile; she spearheaded a professional attitude to choral conducting training, and she has contributed enormously to the raising of standards, including at high school level. When Guy Jansen had completed his doctoral studies at USC he was determined to share his new-found learning with fellow Kiwis, in particular to pass on an appreciation of the physical gestures of choral conducting which he had learnt in the twice-weekly graduate conducting classes taught by Professor Rodney Eichenberger. He no longer had any faith in the frustrating ‘trial and error approach’ which he and many others had had to endure. And so began, in January 1986, the International Summer Schools in Choral Conducting, with principal organisers being the Nelson Polytechnic, “in association with the Department of Education, and the New Zealand Choral Federation” (formed in the previous year) and the Nelson School of Music which was based in the beautiful summer seaside resort chosen for the first five schools. At that first school Professor Peter Godfrey, Ms Faye Dumont of Melbourne and Dr Guy Jansen were tutors. Generous assistance was gained from the Department of Internal Affairs for scholarships for 20 young conductors, and a total of 100 people over the age of 18 attended from Whangarei in the north to Invercargill in the Deep South. They represented all achievement levels. A tutor at the second School a year later was Eric-Olaf Söderstrom, a former member of a prize-winning Finnish choir, Candomino. Dr Karen Grylls joined the faculty that same year after returning from graduate study at Washington State University in Seattle. Peter, Karen and Guy acted as an informal artistic committee for the next 25 years. Between 1986 and 2011 fifteen week-long schools were held, most in Nelson and Wellington, but others in Upper Hutt, Auckland and Hamilton, and in Brisbane, Australia. In addition various centres were covered by shorter Choral Clinics and a Choral Retreat. From the beginning Summer Schools were very popular, the most successful period beginning in January 1999 when over 200, including many New Zealanders, attended the school at the University of Queensland, Brisbane. Two years later a faculty of six taught at successive, large Brisbane and University of Auckland schools. Participants came to the events from Australia, Singapore, and the United States, and there was always at least one international expert in the teaching of conducting. Participants were initially surprised at the constant use of video feedback in tutor groups and, in view of the sense of vulnerability that accompanies conducting training, it was important to build a tradition of a non-threatening atmosphere in the classes. Vocal skills for conductors became a major focus. Over the years there was a fascinating array of visiting voice teachers, conducting tutors and overseas choirs-in-residence, with Rodney Eichenberger involved the most often. New Zealand Youth Choir and Voices New Zealand Chamber Choir appeared from time to time, along with choirs from Finland, USA and Australia. An accompanists’ or administrators’ course was sometimes presented, and New Zealand music was always prominent, including three commissioned works. Maori waiata were used as part of a powhiri (opening welcome ceremony) as well as in tutorial groups. In time it became clear that Summer Schools could not offer all that was needed. Regardless of how well received any school was perceived to be, one week’s tuition a year was insufficient to develop the skills, understandings and values necessary for an adequate conducting education. At the final ISSCC in Wellington last January a new Association of Choral Directors was formed within the Choral Federation at an impressive dinner and ceremony addressed by the Minister for the Arts, Chris Finlayson. Previous Post: Critic’s Pick: Tod, Wo Ist Dein Sieg?